HOMESTEAD, Fla. — Jumping like aquatic action figures into the waters of Boca Chita Key in Biscayne National Park is not a feat for everyone, especially with the added risk of getting speared, losing oxygen and or even a finger. 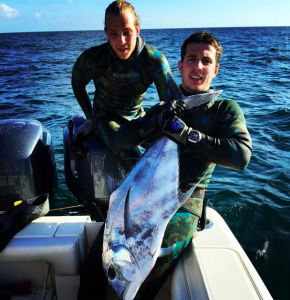 All of which have or have come close to happening to Ricky Benvunuti, 20, a Miami resident who has been spearfishing since he was eight years old. Click on the video to view an audio slideshow about spearfishing around Boca Chita Key narrated by writer Kit Pilosof. Boca Chita Key is a small island located approximately 12 miles south of the Cape Florida lighthouse on Key Biscayne and nine miles east of Convoy Point. The edges of the fishing zone are shallow and the deepest point reaches about 30 feet. “I started fishing with my dad in the Bahamas. He had a big boat and we would take it there on long weekends. Now you can’t use spearfishing guns there so I prefer to stay in Miami. I’m a part of a few local spearfishing clubs. It’s become a big part of my life,” said Benvunuti. Ricky Benvunuti, right, and Austin Muth, left, caught a silver snapper just off the coast of Boca Chita Key. Some snapper can weight more than 50 pounds (Photo courtesy of Ricky Benvunuti). The boat ride from Benvunuti’s home in Coral Gables to Boca Chita takes about 20 minutes. It is one of a few uninhabited islands in Biscayne National Park including Elliott and Adams keys. These are the northern-most keys in the Florida Keys chain of islands, which were saved from development in the 1970s. Spearfishing is permitted in Biscayne National Park in accordance with all Florida state regulations. The trip takes you across Biscayne National Park and on a calm day you can look into the clear waters and search for sponges, rays and dolphins. “There’s a shipwreck in a channel between the two islands. 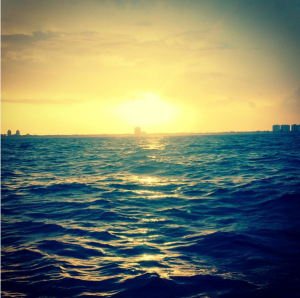 They are barrier islands that protect the Florida coast and are the reason that Biscayne Bay is a bay. This is where we dive,” said Bruno Bacci, 19, a friend of Benvunuti’s who owns the fishing boat. 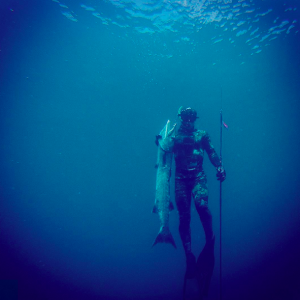 Bacci also began spearfishing in the Bahamas; a missed flight led him into a chance encounter with a group of fishers. He purchased a speargun as soon as he returned to Miami and has kept it up ever since. 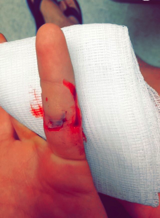 Benvunuti speared his finger a year ago while diving — a common accident among spearfishers (Photo courtesy of Ricky Benvunuti). “There’s significantly less fish in Miami than in the Bahamas. However, this park does a good job of protecting the wildlife by creating no fishing zones and mooring buoys to keep people from dropping anchors on the coral,” said Bacci. Lobsters are prohibited to fish for in the area as the park is a lobster sanctuary. The National Park Service was looking to ban spearfishing entirely, but after much debate came this lobster prohibition, benefiting the park because it is a spawning ground and lobsters are now safe to deposit their eggs in the area. Other regulations that ensure the park stays at its current condition are not allowing the disposal of fish remains in the harbor and setting barriers to fish: it is not permitted in the harbor, the no wake zone, the creek leading into the wetlands or the western bulkhead of the island. The hope is that with these regulations in place the fish can populate the area and benefit the park, the reef and in turn the fishermen. The ultimate goal in spearfishing is to catch full-grown fish as opposed to baby fish that need to breed thus making the activity far more environmentally conscious than regular fishing. “Regular fishing might get you 20 small fish in an hour whereas I just wait for the prey, shoot it and can have a big fish in a matter of 10 seconds. I don’t miss a fish. That’s the beauty of spearfishing. I once caught this African pompano that fed 10 people,” said Benvunuti. A spearfishing tournament in Mexico — tournaments exist throughout Miami hosted by Florida Spearfishing Group (Photo by Bruno Bacci). The African pompano is a widely distributed species of tropical marine fish found in warmer waters across the globe. Categorized as a “game fish” the pompano is considered one of the strongest fish and can often get aggressive. As juvenile fish they float with ocean currents but when full-grown they inhabit coastlines in waters no deeper than 100 meters – ideal conditions for spearfishing. The most common fish to catch in the Boca Chita area are snapper, grouper and weakfish, dependent on the season. In these winter months, stone crab is in season. It is considered significant to both the fishing community and Biscayne National Park to catch a lionfish because they are an invasive species. No other fish eats them because they are from the Pacific Ocean, not the Atlantic, and therefore are not prey in Miami. They end up eating all infant fish from the big fish, preventing them from spawning. The Miami skyline viewed from above Boca Chita Key (Photo courtesy of Biscayne National Park). Matt Johnson, public affairs officer and past park ranger at Biscayne National Park, wants visitors to treasure the area. Johnson has an environmental law degree, is highly trained in public lands management and was educated as a park ranger at eight national parks including Yellowstone and the Grand Canyon. Johnson has a law degree specializing in environmental law and is trained in public lands management. He was educated as a park ranger at eight national parks across the country, including Yellowstone and the Grand Canyon. Spearfishing requires a license, which is the same as a regular fishing license and can be acquired on the Florida Fish and Wildlife Conservation Commission. Full gear includes fins, a mask, snorkel, life weight, wetsuit and spear gun. Depending on the method of ones dive, a tank might be necessary in deep waters. Benvunuti and Bacci explain that they prefer not to use a tank because, although you can go deeper, the gases expand and contract in your lungs as you go up and down. Divers can blackout and drown from this because the pressures become too high to handle. 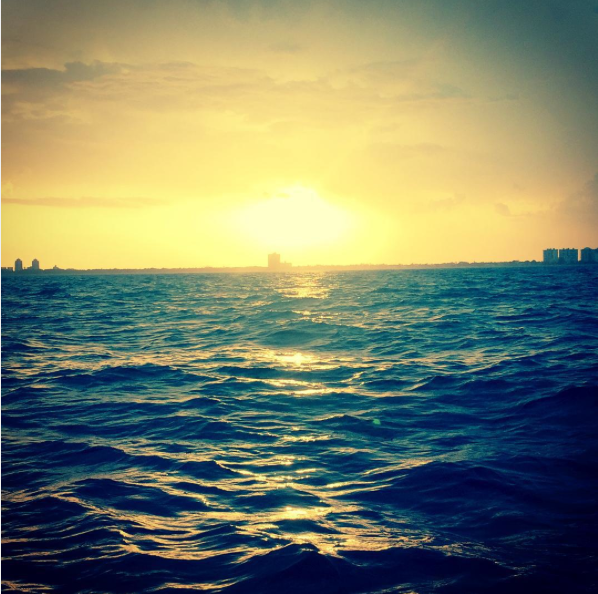 Sunset view of Miami from the waters of Biscayne National Park (Photo courtesy of Ricky Benvunuti). Boca Chita eliminates this danger because it is shallow enough to hold your breath on a short dive and still see a potential catch. Spawning occurs in January through to July, with May being the peak month. This is when the most amount of fish populate the area. “I usually catch about 10 medium to big size fish on a good day out here. I love finding lionfish because it benefits the park habitat too. They are surprisingly delicious to eat. But they can be incredibly poisonous, as people tend to be allergic to them,” said Benvunuti. Following fishing, groups can dock off on the Boca Chita beach and campsite where picnic tables and barbecue grills exist to cook the catch. Supposedly there’s many ways to spear a fish – why not in a protected bay with a view of Miami? 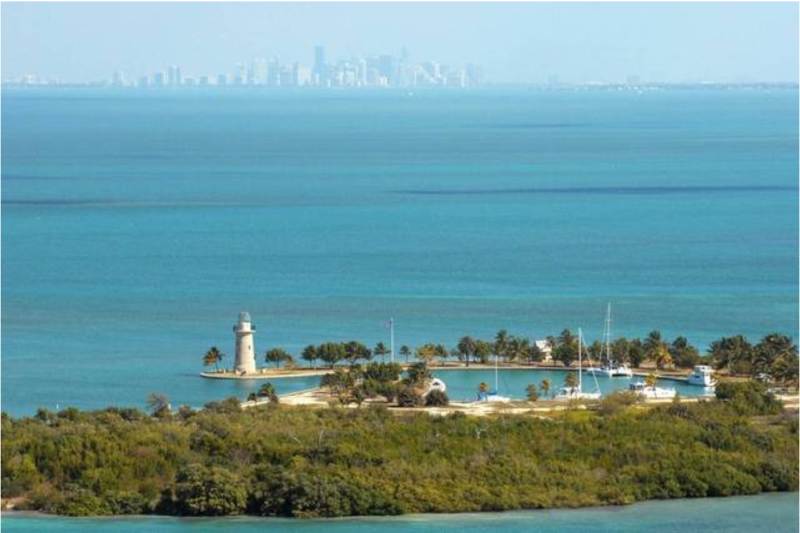 The majority of Biscayne National Park is accessible only by boat and is open 24-hours a day. Boca Chita Key is four miles north of Elliott Key or 11 miles northeast of the Dante Fascell Visitor center at Biscayne National Park. It is accessible only by boat. A Florida Saltwater Fishing License is required in Biscayne National Park. Attain a fishing license at https://license.myfwc.com/Customer/InternetCustomerLookup. There is no entrance fee to visit the park however if people want to dock their boat overnight or rent a camping site there is a fee. A $25 fee is required per night to camp out in Boca Chita Key. This price includes the use of the camping area for up to two tents and six people at no extra charge. Any boat in the harbor after 5 p.m. is required to pay this fee. Docking space is available on a first come first served basis. Reservations are not accepted. Biscayne National Part offers access passes to American citizens and permanent residents who are disabled or blind. The free pass admits the pass owner and any company in the same boat. Senior visitors or those with access passes can receive a 50 percent reduction on camping and docking.